The 1970s master suite addition and remodel provided ample storage for the couples clothing and accessories that the original master suite didn’t. The as-built bathroom was too small for both of them to occupy at the same time. The husband banged his elbows on the shower walls and bonked his head on the showerhead. Not a pleasant way to start the day! Neither of them liked the “chopped off” appearance of their home when they approached the garage. An 8-foot addition to the second floor above the garage corrected the off-balance appearance, and gave them lots of needed space for their updated master suite. 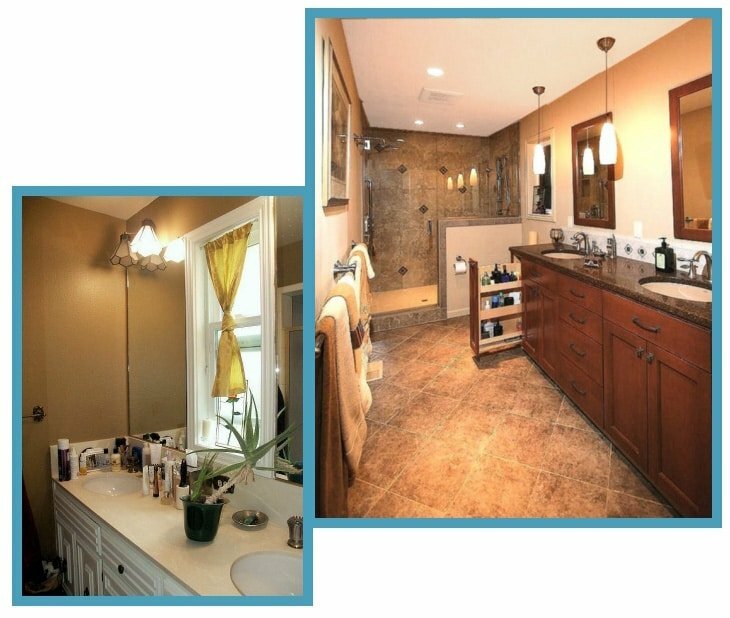 The new bathroom has a two-person shower, and two lavatories with lots of space for personal-care products. Natural-looking shower and floor tile blend beautifully with the alder cabinets and the Silestone countertops. The bedroom now has two generous walk-in closets for the husband and wife to store all of their clothing and accessories. The bedroom has a bonus sitting area for relaxed weekend coffee, reading, and conversation. This bathroom was featured in The Oregonian. See a link to the new kitchen below the photographs.